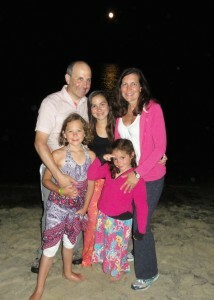 This summer Amy and I had our 13th anniversary. It’s been 27 years since we first met, so I think my long game has really paid off. Since Amy has never been one to toot her own horn, and anyway her horn is stowed somewhere in the garage, it falls to me every so often to praise this amazing yet secretly goofy woman. Women’s gathering: For 10+ years now, in both our home in Newton and in Portugal when we lived there, Amy has led a monthly gathering for women based on a curriculum she prepares around a theme such as (inspired by Lean In) “What would you do if you weren’t afraid: summoning our courage and pursuing our dreams.” Amy draws together quotes from literary, philosophical and religious texts to spur the group’s thoughts before the meeting. Then on the night of the meeting, 12-28 women from a wide range of experiences gather at our house and have some snacks (with our thrilled girls bounding around, gobbling and hiding amongst the women before I drag them up to bed), and Amy leads a discussion of the theme. After she’s done facilitating the topic, she writes up everyone’s comments for her own pleasure and others’ inspiration. It has been a huge, understated inspiration to our girls to have their mom bring together this group throughout their lives, and to me to see the enormous impact the group has on its participants. Someday there will be a book on this. Peacemakers class: And what’s more, Amy has also organized since 2008 or so a group of kids our girls’ ages on being peace-makers. 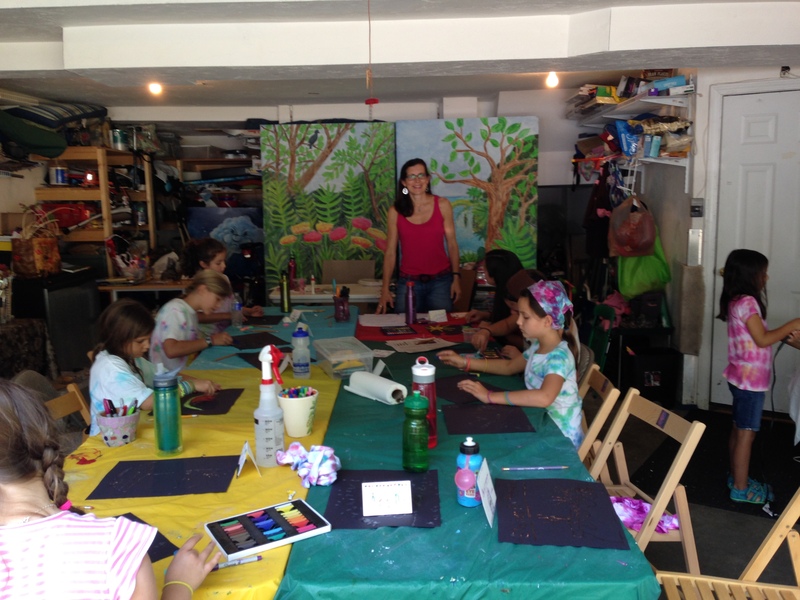 Amy uses role plays, music, some texts from Baha’i or other sources, and her general teacherly wisdom to lead classes for up to 15 kids at a time, sometimes subdivided into age groups with teenage helpers. 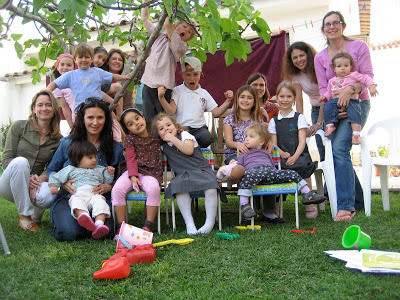 She has also brought the group to do social action projects at local organizations. 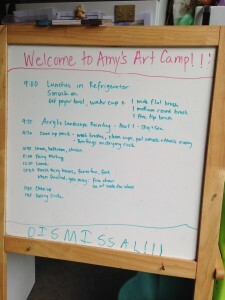 You can read a blog Amy wrote up about the class in 2011. This is another way that Amy has inspired and led not just our family but a good chunk of the local community. Community Connections: Living in our suburban bubble of happy happy, I am particularly grateful that Amy has an inner drive to seek connections with people of other cultures, races and religions. Heck, I guess that last part is why I’m writing this in the first place. For our local school, Amy has taken on the leadership of a committee that puts on programs for local parents and also those families who live in Boston and attend the school through the METCO program. This summer we’ve had a couple of meet-ups in Boston, at the zoo and then at a family’s home. Amy’s super-sized love and honesty has helped the connection between Newton and Boston families through these events be genuine and fun. I am so grateful to be part of what Amy and others are helping to build through these gatherings. 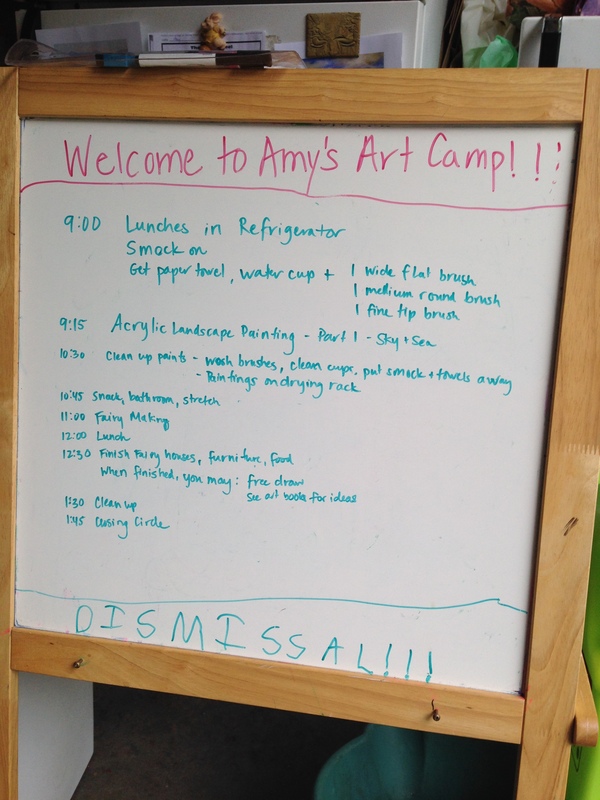 Welcome to Amy’s Art Camp! What’s next? Amy is embarking on a graduate certificate course in parent coaching. You may not know that parent coaching is a thing, but if you’ve watched “Nanny 911” or walked into a bookstore or heard about the “Tiger Mother,” you know that people are more open than ever before about the challenges of parenting and how to get help. Amy has talked to friends about parenting issues for many years, while also struggling mightily with our own parenting ups and downs. Now, she is taking this step to put up a shingle and professionalize her constellation of facilitating skills, ability to address hard questions in an open way, and love of all things related to family. I predict success. Amy has a unique drive to create community through these gatherings and a facilitatin’ genius to guide people through discussions of challenging topics in a way that ends up being fun and productive. Talking with Amy about her plans for the coming year, I was reminded of a quote from the catcher who caught one of Nolan Ryan’s no-hitters. The guy said catching Ryan was like being at the wheel of the world’s greatest sportscar. For me I guess the analogy would that I’m making supportive, avuncular comments from the sidecar of a powerful motorcycle as it surges towards…greater peace and unity among all peoples? The metaphor needs some work but I feel privileged and amazed to be with Amy as she makes such powerful, loving contributions to people’s lives and the broader community. 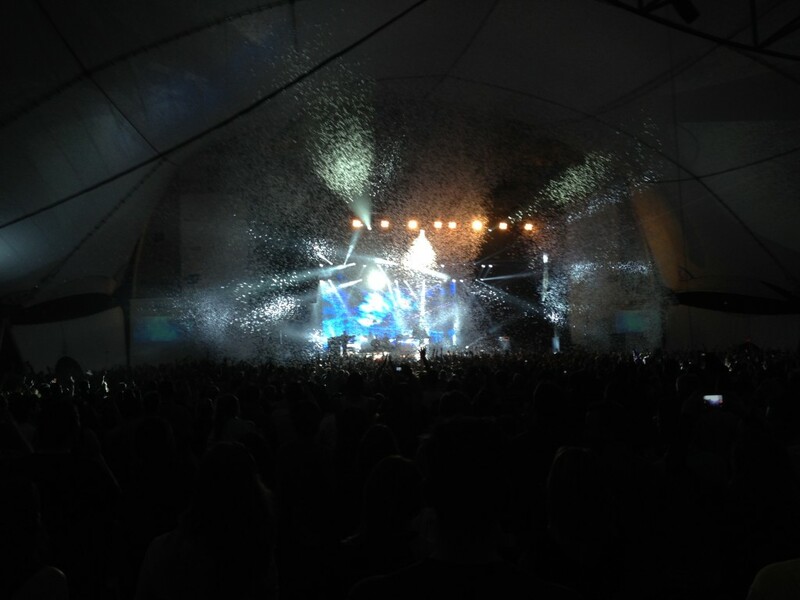 We got to see Robyn on her tour with fellow Swedes Royskopp for their mini-album Do It Again. 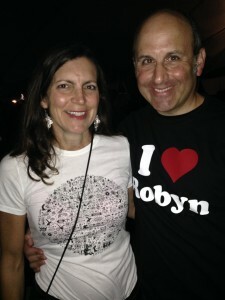 As chronicled previously, Amy and I have been pretty into Robyn for the past three years. The tour with Royskopp had a set of just Royskopp, a set of just Robyn, and then they played most of the songs from Do It Again. The set from Robyn was about 40 minutes of awesomeness. Apart from her biggest dance anthems Call your Girlfriend and Dancing on my Own, which are now clearly the I Will Survive of a new generation, she played Stars 4-Ever from Body Talk. I love this song because it makes me think of Amy doing her workout video with it playing…this was before Amy started listening to Wolf Hall or What is the What while working out ( I could never do that). And the Do It Again set was great too, albeit in a somewhat darker and (even) weirder mode. Amy is not a fan of “Sayit,” but we both watched in amazement as she did about a thousand situps (well, pelvic thrusts really) and hundreds of leg lifts, all in six-inch platform sneakers. “Do It Again” itself was the epic dancefloor ecstasy that everyone came for. And then the encore was “None of Dem” from Body Talk, which was great but, as Amy pointed out, does have a chorus of “I’m so bored of this town/ take me away from here,” which a more scrupulously polite dance diva might think was a rude way to say farewell to her adoring crowd. Amy, you are a wonderful companion and a star 4-ever. Love you.